To ensure the success of your Fourth of July party, you’ll need the right kinds of decor and, of course, the foods and sweets that everyone will love. 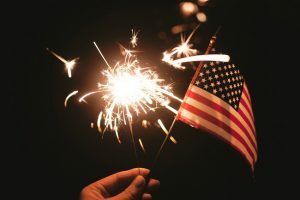 With Independence Day right around the corner, it’s time to make sure your Fourth of July party is fun, festive, and kid-friendly. To ensure the success of any party, you’ll need the right kinds of decor and, of course, foods and sweets that everyone will love. This year, plan for a memorable and patriotic Fourth of July party with these creative red, white, and blue ideas! No Fourth of July party is complete without a good, old-fashioned cookout. Preparing your grill and having all the best sides is the best way to cater to your guests. The sweets table, however, is equally as important as the dinner buffet. Before you fill your table with tasty desserts and gourmet candies, take the time to decorate the table with a red, white, and blue centerpiece or festive runner. If your party will include children, it’s important to make the party just as fun and exciting for the kids as it is for adults. By creating a craft station for your younger guests, every kid will have something to look forward to. With bubbles, snaps, and sparklers, kids can share a game of snap, crackle, and pop that they’ll want to play every year! Another great kids craft idea is creating patriotic confetti poppers. Have kids fill each confetti popper with red, white, and blue confetti along with small gourmet candies like saltwater taffy or hard-shelled summer chocolates for a fun confetti surprise! Enjoying the warmth of the July sunshine means that adults should be playing outdoor games as well. Set up a game of corn hole for an activity that both kids and adults can enjoy together. Collect all the footballs, soccer balls, lacrosse sticks, etc. you have in the garage and set them up in the backyard so that guests can pick them up for a game of catch as they please. With these easy party ideas, your Fourth of July party will be relaxed, festive, and fun. Since 1915, Wockenfuss has been a family owned and operated business creating the finest confections in Baltimore, Maryland. With our nine convenient locations throughout Maryland, there is sure to be a Wockenfuss store near you. Come and visit us to see our selection of summer favorites such as our gourmet truffles & chocolate specialties. This entry was posted on Friday, June 29th, 2018 at 2:37 pm. You can skip to the end and leave a response. Pinging is currently not allowed.